You've spent days and large sums of money in tracking the Beast and now it's come to this. Your bearer trembles as he pulls back the branch giving you a clear view of the Beast in all its splendor. As you steady your aim it turns, looks you in the eye and at that moment you wonder... Who's hunting who? Be a Pulp Era hero exploring Lost Lands and searching for valuable treasure. Lead your tribe of primitive cavemen in a fight against other primitive tribes. Be a modern day big game hunter who travels to a pre-historic land that time forgot. Command a Victorian Era expedition bent on discovery and conquest. Be a dinosaur, not only a dinosaur, but THE dinosaur, as you take on all others for supremacy. Or maybe command a squad of WW 2 GIs blasted into a strange pre-historic world while on maneuvers in Louisiana. 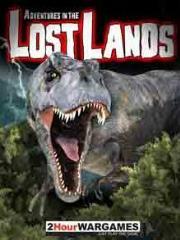 In Adventures in the Lost Lands you can do all of this and more. We've included a number of linked scenarios forming a campaign which can be played solo, cooperatively with all players on the same side, or head to head against your friends. It's all up to you!